Ceiling fans are a way to enhance the value, comfort and beauty of your home. 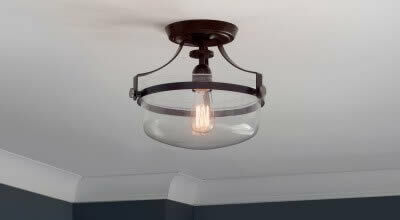 They are a great source of overhead lighting, but they also help you save energy! There are more styles of ceiling fan available than ever before, meaning you're sure to find one that fits your needs. This buying guide will help you understand what to look for when purchasing a ceiling fan. It's an important decision to make because people usually buy ceiling fans with the intent of keeping them for about a decade. If you have questions, feel free to contact us or give us a call at 1-866-688-3562. Before you start shopping for ceiling fans, it's a good idea to know what style you want. We have ceiling fans to suit any decor style: traditional, transitional, contemporary, tropical, industrial, you name it. Here are some examples of the three most common ceiling fan decor styles. Traditional: Traditional ceiling fans often feature decorative flourishes. 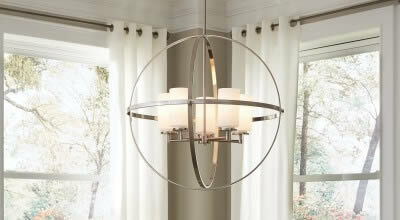 Transitional: Transitional ceiling fans tone down the decorative flourishes for a more versatile look. Contemporary: Contemporary ceiling fans feature inventive and unique designs. Still not sure what your style is? Take a look at our ceiling fans, pick out a few that you like and see if these fans have anything in common. Ceiling fans are mainly divided by whether they are used indoors or outdoors. 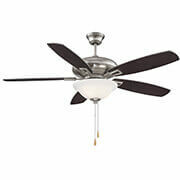 Indoor: Indoor ceiling fans run the gamut of styles, sizes and finishes. Whether you need to outfit a tiny room or a sizable space, there's an indoor ceiling fan to meet your needs. 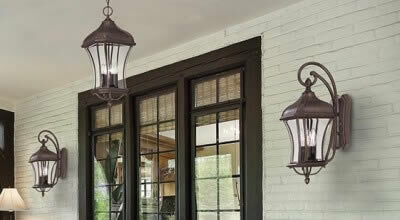 Outdoor: Outdoor ceiling fans are made with more durable materials. There are 2 types. Damp is suitable for use in covered areas like porches and patios. Wet can be exposed directly to rain, making it good for use in gazebos or pergolas. Fan d'Lier: Exclusively from Savoy House, fan d'liers are a unique blend of ceiling fan functionality and the features of a chandelier. They are available in styles with or without lights. Select fan d'liers also have air-ionizing features that improve the quality of the air you breathe. 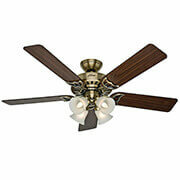 Fan blades: separate blades that can replace the ones already on a ceiling fan, bringing a new look into the room. 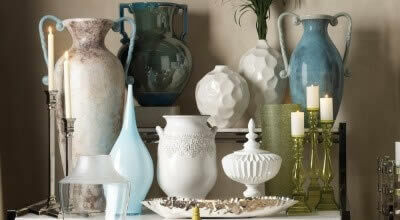 Available in many colors, textures and shapes. Make sure to choose blades from the same manufacturer as your fan! Wall-mounted controls: like light switches, but with more functionality. Wall-mounted controls may let you turn the ceiling fan on and off, change fan speed, dim lights and reverse the blade direction. Remote controls: handheld controllers that do the same things as wall-mount controls. Receivers for wall-mount and remote controls are mounted onto the canopy of the ceiling fan. 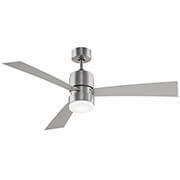 Like with fan blades, buy ceiling fan controls from the same brand as your fan. Canopy: The base of the ceiling fan and the part that attaches to the ceiling. Wall or remote control receivers go here. Down rod: Allows the ceiling fan to hang down from the canopy. Fan blade: The parts that move so you can feel the fan's breeze. Fan motor: The housing that contains the ceiling fan's motor and inner workings. Fan arm: Holds the blades and connects them to the motor. 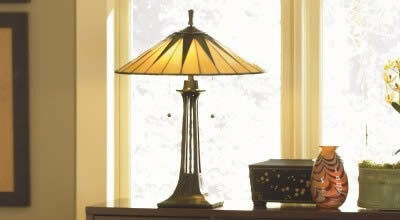 Light kit: Lighting fixtures that are either built into the fan or can be added onto a ceiling fan. Fan controls: A pull chain used to regulate the speed of the fan's blades. This can also be done by a wall or remote control. Light controls: A pull chain used to turn the fan's light on and off. This can also be done by a wall or remote control. The general rule of thumb to keep in mind is this: a ceiling fan that is too big for the space will be overwhelming, but a fan that is too small for the space won't allow you to feel the fan's benefits. Find the square footage of your room (multiply the length and width in feet) and match it with these general guidelines. Small fans of 36" or less are good for rooms of about 6 by 6 feet or smaller. This includes rooms like bathrooms, breakfast nooks and utility or laundry rooms. Medium fans of 42" to 48" are good for rooms of about 10 by 10 feet. This includes rooms like bedrooms, kitchens and dining rooms. Standard-size 52" to 56" fans are good for 12 by 12 foot rooms. This includes rooms like larger bedrooms, family rooms and media rooms. Large 58"+ fans are good for rooms of 15 by 15 feet and larger. This includes rooms like great rooms and other large spaces. If you have higher ceilings, you may want to add a longer downrod that brings the ceiling fan closer to you so that you can feel its effects better. Here are recommended downrod lengths for higher ceilings. To get all the information you need for safe ceiling fan installation, click here. An important thing to remember about ceiling fans is that they don't actually change the temperature of the room. Ceiling fans just provide a breeze. So, when you're not in the room with the fan, turn it off and save energy! You can use ceiling fans during warm and cool weather to keep the room cooler or warmer, respectively. In warm months, use the downdraft setting. In cool months, use the updraft setting. When you think about the efficiency of a ceiling fan, you need to consider airflow, which is a measure of how much air the ceiling fan can move. This is determined through the quality of the ceiling fan's motor, the pitch or angle of the blade and the blade's material. For a residential fan, the best pitch is 14 degrees because it provides the most airflow. The best materials for blades are laminates because they resist warping and are stronger than solid wood. Speaking of the best materials, the quality of the motor is really what you're paying for in a ceiling fan. High-quality motors are encased in heavy-gauge steel, so they're quiet, less prone to rattling and will last a long time. Plus, they tend to look better visually. Trying to pick the perfect color for your ceiling fan? Try identifying the most used color of wood in the room, like the flooring, and pick a fan that uses blades of that color. 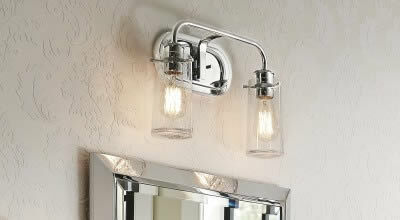 Then pick out the most used color of metal hardware in the room, like doorknobs, and get a fan that has that finish too! Alternately, some people prefer all-white ceiling fans to blend in with a white ceiling. 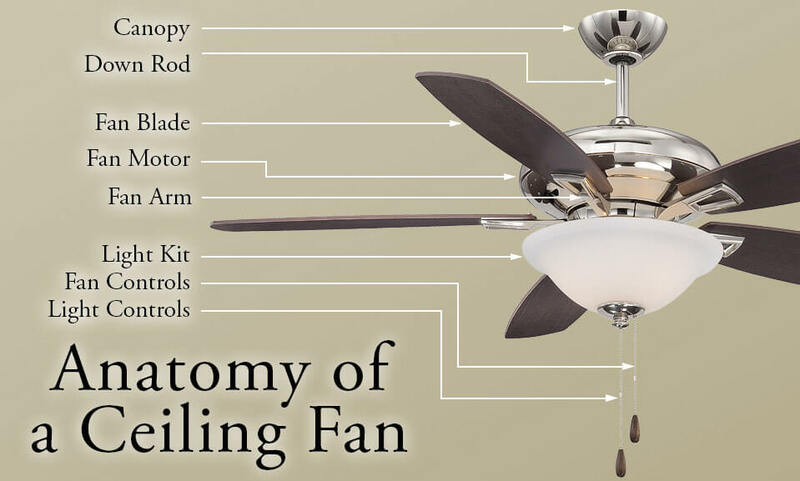 Ceiling fan design has advanced to such a point that the difference in amount of blades (example: a fan with 3 blades versus one with 5) is negligible and mostly based on your decor preferences. All of our ceiling fans include energy guides that tell you the airflow, electricity used and airflow efficiency so you can make the best and most ideal choice for your needs! If you're ready to find your favorite new fan, browse our selection of ceiling fans. Contact us or call us at 1-866-688-3562 for more help! Sign up for our email newsletter today and score an additional discount!